A Website that gets you noticed! Chances are you found my website from a search engine and I'd like to do the same for you. 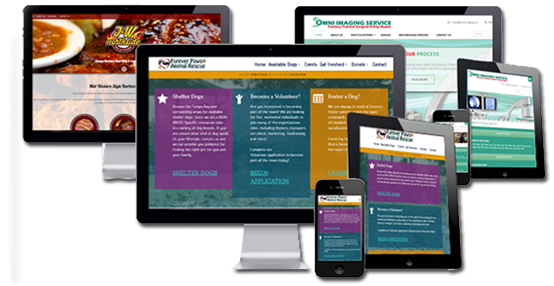 We create stunning websites that not only performs well on any device. Did you know that half, 50% of online searches world wide are now being done on a mobile device? If your website is not mobile compatible simply put your missing out on half of your potential customers. Google also ranks higher, websites that meet its' mobile standards. If your website is not consistently bringing in leads, making sales or getting the exposure you want, it's time to make a change and I'd like to help. With years experience in the digital marketing field, I have had the opportunity to learn from experience what works and what doesn't. Web design doesn't have to be complicated and getting your site ranked higher does not have to be difficult. It takes a solid plan and the ability to execute it. No matter your needs, I'd like the opportunity to help. Website Design should NOT be a one and done deal. Too many times have I worked with new clients hearing the horror stories of their previous web design guy who went MIA a short time after their site went live. A website is not a thing it is an investment into the future of your business. Think of your website as your perfect salesperson. Working around the clock 365 days a year to do one thing, sell your product or service. Your website knows all the facts about what you do, how you do it, when you're available and what your costs are. It delivers a perfect sales pitch each and every time without hesitation. Shouldn't you be taking advantage of that? If you would like to learn how I can help get your business moving in the right direction, give me a call or send me an email. I'd love the opportunity to help get you where you want to be.